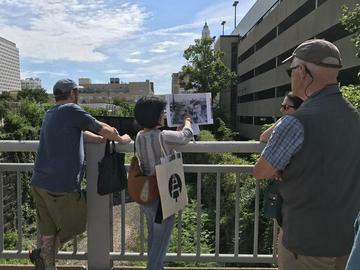 Join Friends of the Rail Park for a street-level walking tour of the proposed site of Philadelphia's next great public space. The tour will follow along elevated and submerged sections of the former Reading Railroad, and tour guides will share stories of its history and visions for the future. We are an all-volunteer nonprofit, and donations help make programming (and tours like this one) possible, so we ask for a $25 donation. But we want everyone to participate and become a 'friend' of the Rail Park. If you would like to register free of charge or by donating what you wish, please email us at friends@therailpark.org. Tours begin at 10AM at 21st and Pennsylvania Avenue on the east side of the Rodin Museum and proceed to 12th and Noble Streets, the site of Phase I, which will open to the public on June 14th! Tours will cover a distance of 1.5 miles and conclude at approximately noon. Wear comfortable shoes and bring some water. Time: Please be advised that the tour will begin promptly at 10am and conclude between 11:30am and noon. We suggest arriving 10 minutes before the starting time to sign in and pick up a map. Location: Beginning at the northwest corner of N. 21st St. and Pennsylvania Ave. and concluding at 12th and Noble. Donations of any amount are greatly appreciated and help make public events and activities, like tours, possible. Additional donations can be made via our website. If $25 is too much right now, just email us at friends@therailpark.org. Additional Info: In case this tour must be cancelled due to inclement weather, you will receive notice by email from Friends of the Rail Park at least 2 hours in advance of the tour. Interested in learning more? Please visit us at therailpark.org and follow us on Facebook and Instagram. Please tag photos from the tour on Instagram [@therailpark / #therailpark].